A key objective of any Service-driven architectural approach is to improve the alignment between business and information technology (IT). Business process management, service composition, and service orchestration, play major roles in achieving this goal. In particular, they allow for the process-aware integration of business actors, business data, and business services. To optimize business-IT alignment and to achieve high business value, the business processes implemented in process-aware information systems (PAISs) must be defined by domain experts, and not by members of the IT department. In current practice, however, the information relevant for process execution is usually not captured at the required level of detail in business process models. In turn, this requires costly interactions between IT departments and domain experts during process implementation. To improve this situation, required execution information should be captured at a sufficient level of detail during business process design (front-loading). As another drawback, existing methods and tools for business process design do not consider available Service-oriented Architecture (SOA) artifacts such as technical service descriptions during process design (look-ahead). Both front-loading and look-ahead are not adequately supported by existing business process modeling tools. In particular, for many process aspects, appropriate techniques for specifying them at a sufficient level of detail during business process design are missing. This chapter presents techniques for enabling front-loading and look-ahead for selected process aspects and investigates how executable process models can be derived from business process models when enriched with additional information. Business process management (BPM) and process-aware information systems (PAISs) have become integral parts of enterprise computing and are used to support business processes at the operational level (Mutschler, Reichert, & Bumiller, 2008; Reichert & Weber, 2012; Weske, 2007). As opposed to function- and data-centric information systems, process logic is strictly separated from application code, relying on executable process models that provide the explicit schemes for process execution (Weber, Rinderle, & Reichert, 2007; Weber, Reichert, & Rinderle-Ma, 2008). This enables a separation of concerns, which is a well-established principle in computer science to increase maintainability and to reduce costs of change. A particular challenge for process-aware information systems (PAIS) is enterprise application integration, i.e., to link the atomic activities of an executable process model with business functions implemented in heterogeneous, distributed application systems. 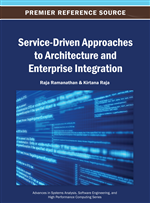 In this context, the emergence of Service-oriented architectures (SOA) and well-defined service principles (Erl, 2005) foster process-centric application integration in the large scale (Weber & Reichert, 2012). A Service-driven approach provides tools for encapsulating heterogeneous application functions as services with standardized interfaces. These services then can be composed and orchestrated in a process-aware manner based on a run-time component called process engine. Altogether, SOA enables enterprise application integration at a high level of abstraction, reducing the need for realizing application-to-application bridges prevalent in current practice (e.g. based on message exchange or remote procedure calls). In particular, any process activity may retrieve data from an application system (e.g. by invoking a corresponding service) and temporarily store it within the process engine. In turn, this data can be consumed, changed, or complemented when executing subsequent process activities (e.g. human tasks). Another fundamental goal of a Service-driven approach is to improve business-IT alignment (Chen, 2008). In particular, a PAIS should meet the needs of the stakeholders involved in the business processes it implements and not reflect only the design decisions made by the IT department. A variety of issues related to business-IT alignment have been investigated in the ENPROSO (Enhanced Process Management through Service Orientation) project (Buchwald, Bauer, & Reichert, 2012; Buchwald, 2012). In particular, ENPROSO revealed that all aspects relevant for process automation should be defined at a sufficient level of detail during the design of business process models. Furthermore, existing artifacts should be reused in this context if available. With front-loading and look-ahead, this chapter presents two fundamental techniques for achieving these goals. Front-loading enables the capturing of relevant aspects for process automation at a sufficient level of detail during business process modeling. For a business process model, it is not sufficient to only specify the activities, the rough control flow between these activities, and the abstract data objects or roles associated with them. Additionally, the designer of a business process model should capture information relevant for process execution, e.g., about actor assignments (Rinderle-Ma & Reichert, 2007; Rinderle-Ma & Reichert, 2009), user forms (Kolb, Hübner, & Reichert, 2012), and exception handling procedures (Reichert, Dadam, & Bauer, 2003). These and other aspects constitute relevant information for process implementers and therefore should be captured in business process models. They will be discussed in detail in this chapter. In particular, business process models shall be detailed enough to constitute a valuable artifact for process implementers. Note that the latter usually do not have detailed domain-specific knowledge.